• Work-Life Integration - How can you be whole at home, at work, and in the community? • Education and Lifelong Learning - Do you really need a graduate degree? • Mentor and Sponsor Relationships - How do you find mentors and sponsors and form productive relationships with them? • Career Challenges - How do you evaluate when to take career risks? How do you say yes when all the boxes aren't checked? • Resilience - Where do you find the internal fortitude to keep going? • Personal Satisfaction - What do these leaders find most joyful about their careers? The Road to the Top is Not on the Map features female leaders who candidly share the habits, motivations, triumphs, defeats, and lessons learned that helped them achieve top jobs in the industry. Their insights have relevance for women at all stages in their careers, whether its young women interested in pursuing a career in the auto industry, those looking for their next strategic move, or those seeking insight and inspiration. "The women in this book share a passion for their careers and a passion for the industry. They have encountered obstacles and the occasional failure, as well as successes, but they have embraced all their earned wisdom and generously agreed to share it." 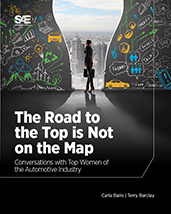 If you do not have access to SAE MOBILUS via username/password or institutional access, you can still purchase the Book, The Road to the Top is Not on the Map: Conversations with Top Women of the Automotive Industry.